Fujitsu Japan has announced a range of PCs “planned and developed primarily under the direction of female employees” and “aimed at female users”. The 'Floral Kiss' range of computers is an extension of the LifeBook line and will go on sale in Japan next Friday. Fujitsu's statement about the machine does at least immediately mention some technical details, namely that the ultrabooks run Windows 8, various third generation Core™ i5 CPUs and 500GB of hard disk. But those details are dealt with quickly, with the bulk of information on offer covering features like a scrapbook app, diary program that aggregates posts from Facebook and Twitter and a horoscopes service. A “pearl-like accent” adorns the machines' power button, while “the power status LED and Caps Lock key are decorated with diamond-cut stone for a sophisticated look. “An exquisite gold ring frames each key on the transparent keyboard” and there's a flower on the air vents. One of the venues the machines will go on sale is at high-end jeweller agete, which means a special model bearing that brand's logo and colour scheme, plus a matching handbag. 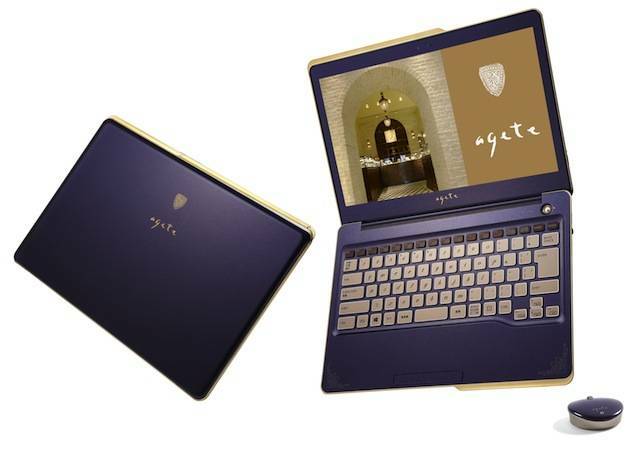 There is, of course, precedent for this kind of thing in the form of luxury-car-branded PCs that are almost certainly aimed primarily at men. ASUS has also offered leather-trimmed PCs aimed at those more concerned with looks than performance.